For the history after 2003, see National Museum of Art, Architecture and Design. The National Gallery (Norwegian: Nasjonalgalleriet) is a gallery in Oslo, Norway. Since 2003 it is administratively a part of the National Museum of Art, Architecture and Design. In 2017 admission cost 100 Norwegian kroner. In 2016 the price for admission doubled overnight. 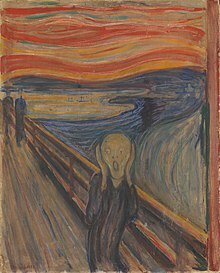 The Gallery includes pieces by sculptor Julius Middelthun, painters Johan Christian Claussen Dahl, Erik Werenskiold and Christian Krohg as well as works by Edvard Munch including The Scream and one version of his Madonna. The museum also has old master European paintings by painters such as El Greco, Lucas Cranach the Elder (Golden Age), Gaulli (Sacrifice of Noah), Orazio Gentileschi, Artemisia Gentileschi, Andrea Locatelli (Bachannal Scene), Pieter Elinga (Letter Carrier), Ferdinand Bol, Daniel De Blieck (Church Interior), Jacob van der Ulft (Seaport), Cornelis Bisschop (Seamstress) and Jan van Goyen. There are also 19th and 20th Century International paintings by Armand Guillaumin, Carl Sohn, Auguste Renoir, Claude Monet (Rainy Day, Etretat), Paul Cézanne, and Pablo Picasso. There are also Norwegian paintings by Adolph Tidemand, Hans Gude, Harriet Backer, and Lars Jorde. The actual museum collection will be moved in a new building, opening in 2020 and gathering all the different sections of the National Gallery, except architecture. The architect of the new building, which will be located on the harbor front, and part of the Fjordbyen development, is the German firm Kleihues + Schuwerk Gesellschaft von Architekten mbH. ^ "Norway's largest collection of art, architecture and design". www.nasjonalmuseet.no. Retrieved 19 April 2018. ^ a b "Dobler billettprisene". klassekampen.no. Retrieved 19 April 2018. ^ Henriksen, Petter, ed. (2007). "Nasjonalgalleriet". Store norske leksikon (in Norwegian). Oslo: Kunnskapsforlaget. Retrieved 26 December 2010. ^ a b Frivik, Karen Riekeles (2013-04-30). "Teknisk uegnet for malerier". Aftenposten. p. 6 D.
This page is based on the Wikipedia article National Gallery (Norway); it is used under the Creative Commons Attribution-ShareAlike 3.0 Unported License (CC-BY-SA). You may redistribute it, verbatim or modified, providing that you comply with the terms of the CC-BY-SA.